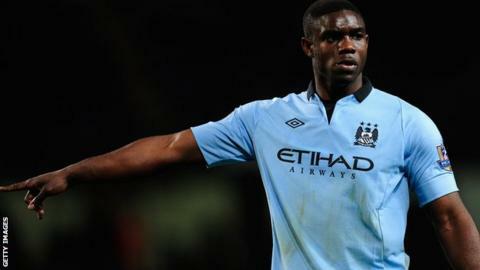 Manchester City's Micah Richards has ended his 12-year stay at the club by joining Fiorentina on a season-long loan deal. The Italian club have paid £3.5m for the defender which will rise to £4.7m if they make the move permanent. The 26-year-old is City's longest serving player. It is understood he turned down a number of offers from Premier League clubs in order to join Fiorentina and is "excited" about the challenge. The versatile defender, who can play at right-back and centre-back, has found his City chances limited under Manuel Pellegrini. He becomes the 24th Englishman to play for a Serie A club. Birmingham-born Richards was a key member of the City squad that won the Premier League in 2012, but made just two Premier League appearances last season and has one year remaining on his contract. He joined City as a 14-year-old from Oldham and made his Premier League debut in October 2005. A year later he became the youngest defender ever to be called up to the England squad - aged 18 - and won 13 caps for the national team. He was linked with a £20m move to a host of top clubs in 2011 but a number of injuries and the emergence of Pablo Zabaleta as City's first-choice right-back limited his opportunities. His prospects of playing time were further reduced when City signed Bacary Sagna from Arsenal in the summer. City captain Vincent Kompany tweeted: "#MCFC club legend! Proud to have played 6 years alongside this man. Congratulations and good luck at @ACF_Fiorentina my brother #forzaMicah." Richards, who has made almost 250 appearances for City, has accepted he has to leave to get more games and recapture the form that made him one of the country's most exciting prospects when he first burst on to the scene.